I so enjoyed working this blackwork design. I have been addicted to these sheep since I saw a post about them on Facebook. They are adorably cute and unlike most sheep comfortable around humans, they will come up to humans to investigate and cuddle. 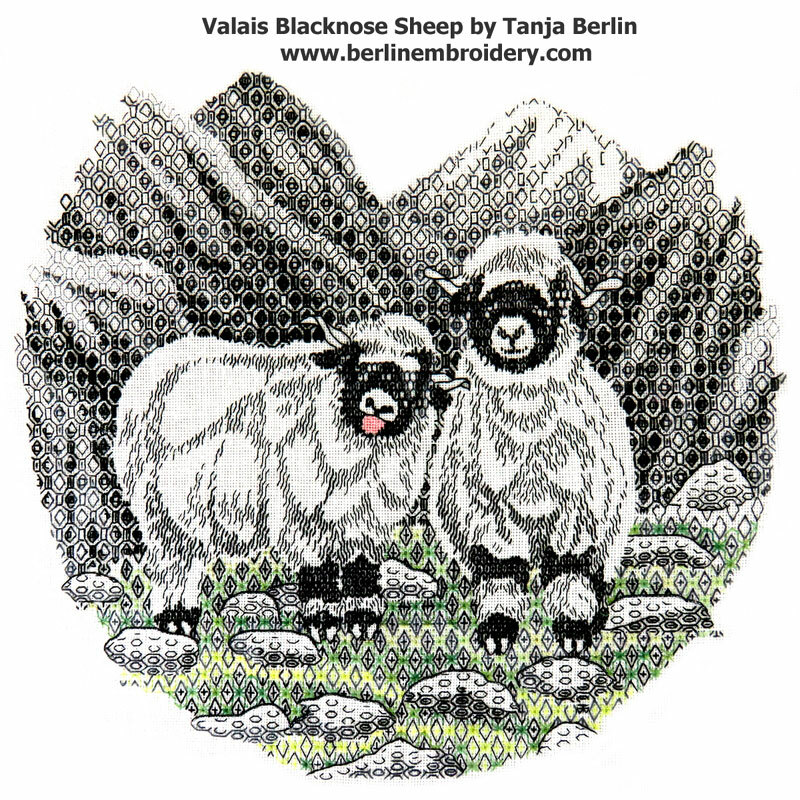 I added some green to the grass to give the embroidery some warmth, I designed a crimped looking pattern for the wool to give them the shaggy look and added a characteristic pink tongue to one of the sheep. The sheep often have their mouths open showing their cute pink tongues. I call the left one Quincy and the right one Monty. I am proposing the embroidery to be taught at Canada and USA national seminars and after that the design will be available as a kit and on-line class. It could be a while down the road before the design is available. Keep an eye on my email newsletter for further information. The design will be an intermediate to advanced design so if you would like to try your hand at blackwork, I have lots of blackwork designs in beginners, intermediate and advanced levels.